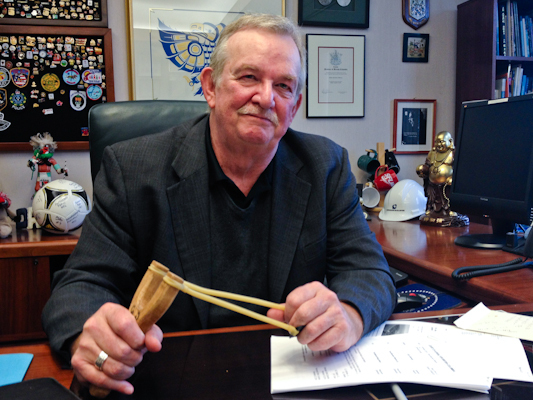 On Derek Corrigan’s desk sits a wooden slingshot, a gift from a Burnaby resident to the mayor at the centre of an increasingly heated battle with Kinder Morgan. 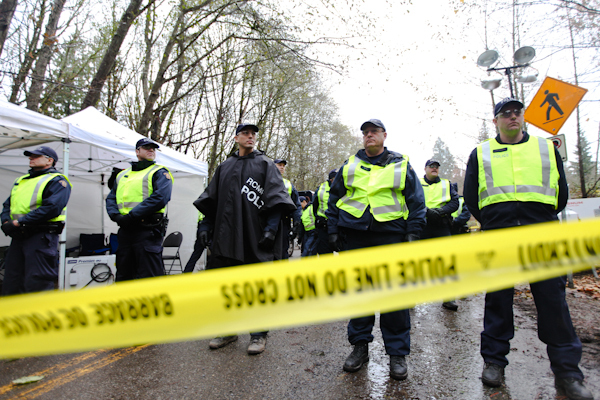 Against Corrigan’s wishes — and despite several ongoing city legal challenges — the Texas pipeline giant conducted exploratory drilling deep into Burnaby Mountain Conservation Area last week, sparking more than 100 arrests this week under a court injunction protecting company workers. On Thursday, those civil contempt charges were thrown out after a judge agreed Burnaby RCMP made the arrests outside the boundaries of a court order; he also rejected Kinder Morgan’s attempt to expand and extend the injunction to Dec. 12, so the firm must be out of the park by Monday. Nearly two weeks into Corrigan’s third victory for the mayor’s seat, the outspoken civic leader sat down with The Tyee to talk about what’s really behind his fight against the pipeline — and what’s ahead. He said the struggle is not just against Kinder Morgan’s $5.4-billion Trans Mountain expansion, which would see the existing pipeline’s flow from Alberta’s oil sands triple to 890,000 barrels a day. * On a deeper level, it’s about regaining democratic control over government institutions ”meant to protect us,” Corrigan said. Earlier this year, Corrigan told media he was willing to lie down in the path of a bulldozer if the project was allowed to go ahead and his legal challenges failed. A few Burnaby Mountain demonstrators this week grumbled about the apparent gap between Corrigan’s fighting words and his absence from the activist front lines. His battle against Kinder Morgan’s preliminary work is headed to Canada’s highest court, and he’s also fighting the National Energy Board’s right to override city bylaws. But the pugilistic mayor’s growing confidence is tempered by the limited powers held by municipalities in Canada. Because of that, some call his protests merely quixotic — tilting at borehole drills. Cities have no protected status or role under the country’s constitution. So if a municipality like Burnaby doesn’t want a pipeline — or if Vancouver rejects oil tanker traffic — neither actually has any say over the matter. Like Corrigan, Vancouver’s Mayor Gregor Robertson was re-elected Nov. 15 with an anti-pipeline stance. Robertson faced criticism from his Non-Partisan Association opponents who accused him of ”disingenuously” campaigning on matters outside his jurisdiction. ”Municipalities are creatures of the province in our constitution,” explained Simon Fraser University political scientist Patrick Smith, who researches metropolitan governance and local democracy. ”The silent player here in all this has been the province. If anything, the province’s silence on Kinder Morgan has galvanized Corrigan’s resentment over having his wishes bulldozed. The B.C. government should enforce its own environmental assessments of Kinder Morgan’s proposal and stand up for municipal land use bylaws, he urged. Robertson admitted it has been ”very challenging” to ”push back” on the Kinder Morgan proposal, given the thorny jurisdictional issues with the province and feds. ”We’re being stymied … which is incredibly frustrating,” Robertson complained. ”But it is difficult given the archaic laws of Canada and the constitution not recognizing local governments. Another less discussed factor in the Burnaby equation is the city’s existing Chevron oil refinery on the shores of the Burrard Inlet — next to Kinder Morgan’s terminal and oil tank farm. Corrigan acknowledges the refinery plays a role in his opposition to Trans Mountain. ”It’s ridiculous that we’re not refining [more] oil in our own country,” he explained. 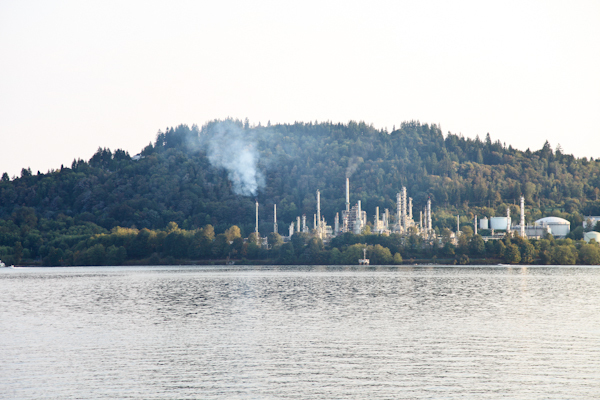 ”In the case of the Chevron refinery…there’s a lot of jobs in our community as a result of that — a few hundred. But the National Energy Board rejected Chevron’s application despite Corrigan’s endorsement. He said he fears that continuing the drive towards exporting unrefined bitumen overseas will put local jobs at risk. Unifor, the union representing refinery workers, has also come out against Trans Mountain. Asked if he ever feels it’s hard to compete with Corrigan’s tough talk about bulldozers or his recent proclamation ”this is going to be a war,” Robertson laughed. There’s still a distance to go in the road ahead, Robertson said; he’s choosing the path of endurance. Pushed on whether he’ll be blocking tankers on a paddleboard at any point in coming years, Robertson dodged with another chuckle. ”Whatever makes a difference at that point,” he quipped. Given the pipeline’s centrality to Corrigan’s campaign, his landslide re-election has ensured the Burnaby mayor has both the legitimacy and leeway to carry forward on his promises, Smith argued. But for Corrigan, the issues go well beyond one project, company or regulator. ”This is a battle worth fighting” for more than just reasons for climate change or peak oil, he said. Corrigan’s war is over enlarging the power of cities. Corrigan feels he’s in the right place at the right time to set the stage for a historic showdown over cities’ short end of the constitutional stick. ”I think other cities are going to join with us and we’re going to demand a new deal,” he said. ”I’m stepping up because I think I’m capable of continuing this argument in a forceful way — to change the way things are.